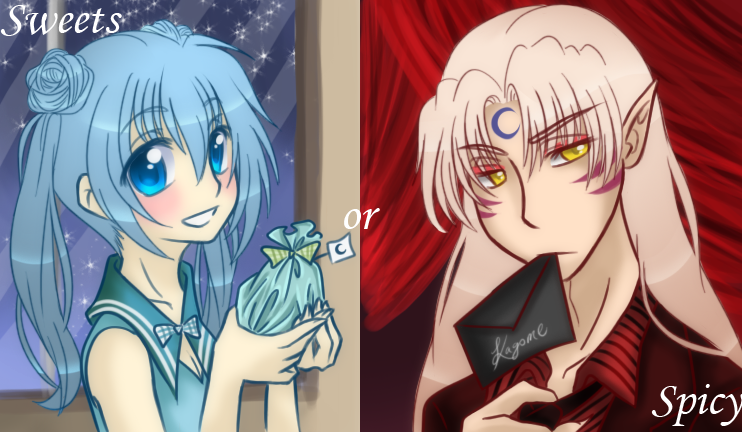 Gallery - Category: Fanart - Picture: Sweets or Spicy? I don't have a romantic bone in my body so when I try to force it out, bad drawings ensue. I only continued this drawing to try out different coloring techniques. Not very happy with the outcome but it was a nice change of pace. 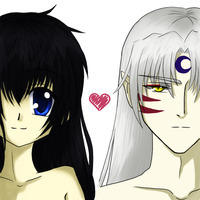 Kagome made cookies and Sesshomaru wrote...a poem? Confession? Nothing to distract and pounce her? Who knows? My mouth dropped open, and I am in awe at how hot this is. I love this! I don't see how you don't have a romantic bone! I think this is VERY romantic and so adorably wonderful! It's very cliche to me with a slapped together background and no thought in composition. This was all I could think of for a V-day pic and I find it disappointing. 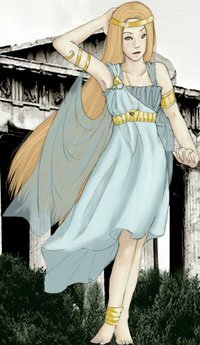 Did you use a picture from Full Moon wo Sagashite as a reference? The poses look really familiar. Only reference was from Gentleman's Alliance and that was for Kagome's hair. Do you have the image in question? It is a very nice piece you've made, btw. Their expressions fit them perfectly. Well, my style is largely based on Arina Tanemura's, so the connection is there.